The Grundtal cutlery caddy from IKEA was made to hang silverware in the kitchen, but Flickr user iheartukeleles has turned them into office organisers that get our office supplies fetish all worked up. 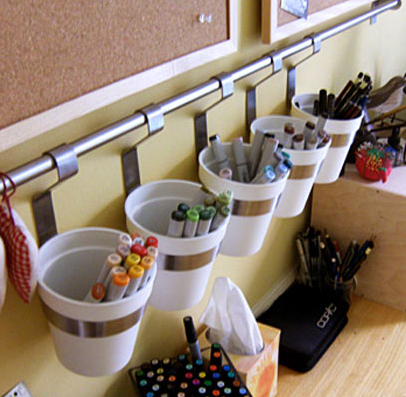 It's a simple organiser: Just install a wall rack, buy yourself some Grundtal hangers, and get your organisation on. The Grundtal hangers are $8.95 apiece from IKEA, but if you've got a passion for the DIY, I'm sure you could rig together your own version of these attractive, clutter-hating hangers for a little less. Either way, we love the idea.